Like other web applications, Oracle ADF applications potentially use a lot of JVM memory. Many times, the root cause of a high memory usage is that application data retrieved from the database into memory is not properly limited; hundreds or thousands of rows (with too many attributes) are fetched and held in ADF BC memory. This can lead to memory over-consumption, very long running JVM garbage collections, a freeze of all current requests or even OutOfMemoryErrors. To make matters worse, these rows and their attributes are frequently retained (passivated and activated) in the session for an unnecessary long period of time. 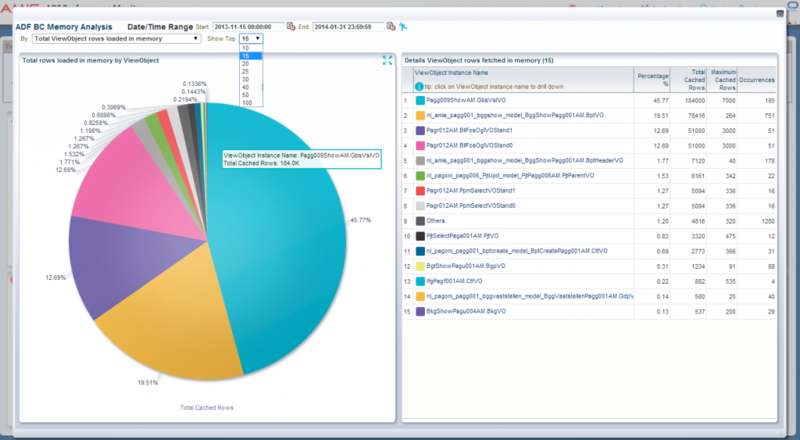 The solution to this problem can be found in reducing the size of sessions by decreasing of the amount of data loaded and held in the session. With a low memory consumption, a more responsive, stable and scalable ADF application can be delivered. 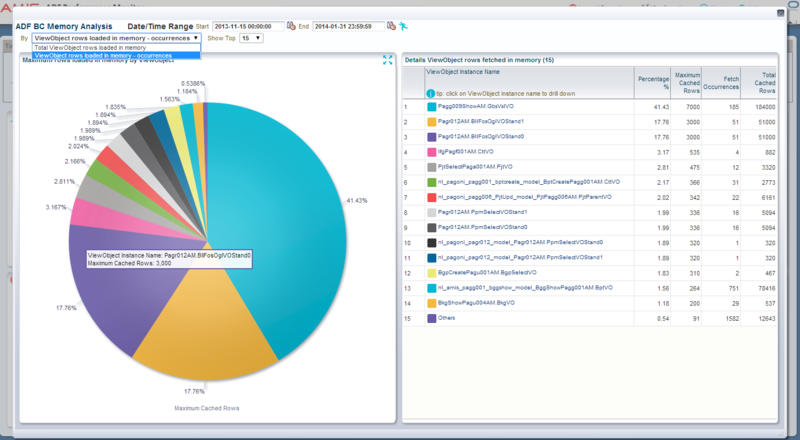 This blog describes one of the new features of the ADF Performance Monitor; a kind of ADF BC memory recorder and analyzer. It detects and warns when too many rows are being fetched (from the database or webservice) and held in ADF BC memory. For a selected time range (month, week, day, hour, 5 minute), the tool gives aggregated overviews for each ViewObject instance how many rows have been fetched/loaded into ADF BC memory (ViewObject row cache and entity cache). 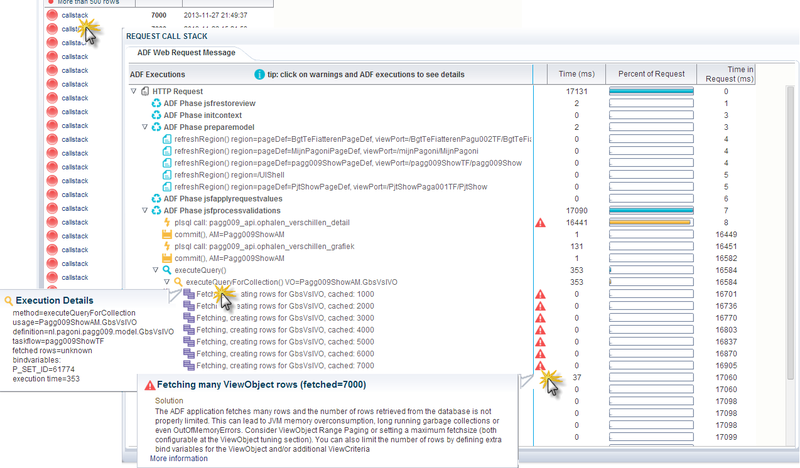 ViewObjects that frequently fetch hundreds or thousands of rows – and potentially waste memory – can be detected. Individual high fetches/loads can be further analyzed. The total (sum) of all the ViewObject rows (by ViewObject) that are created in ADF BC memory and fetched from the database. 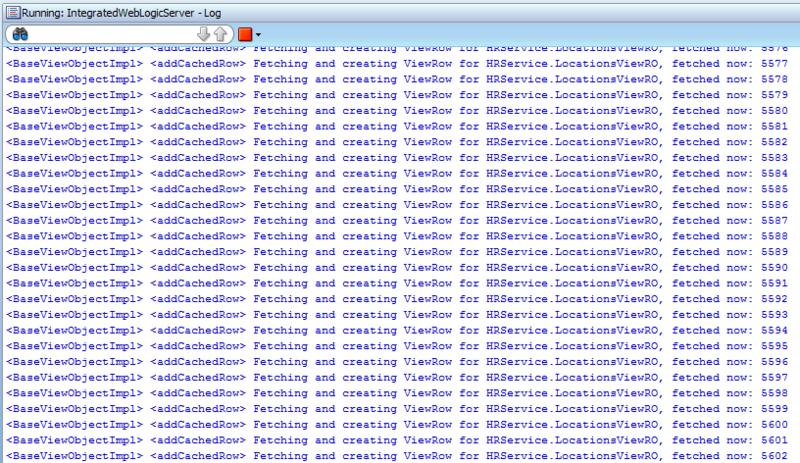 In this overview (screenshot below) ViewObject instances that frequently fetch too many database rows can be detected. The metrics of this example overview is coming from a test server. In this case we can see that ViewObject instance Pagg009ShowAM.GbsVslVO is fetching/retrieving by far the most rows – frequently thousands of database rows. We can see that from mid November 2013 to the end of January 2014 it fetched in total 184.000 database rows (and created 184.000 ViewRowImpl objects). And the highest fetch was 7000 rows in a single HTTP request. This should be a trigger for further investigation. The maximum ViewObject rows (by ViewObject) that are fetched from the database and created (cached) in ADF BC memory in a single HTTP request. In general, to avoid memory over-consumption, very long running JVM garbage collections, a freeze of all current requests or even OutOfMemoryErrors, we should not allow ViewObjects to fetch and load more than ±500 rows. 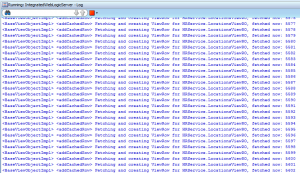 All ViewObject instances that are able to fetch and cache more than ±500 rows should be a candidate for further investigation. In this case (see image below) the same ViewObject instance Pagg009ShowAM.GbsVslVO has fetched the most rows of all ViewObjects in a single HTTP request: 7000 rows. The other ViewObjects that have fetched more than 500 rows should also be investigated. With these two overviews, ViewObject instances that frequently fetch and load too many database rows can be addressed. We can drill down further to the call stack of the HTTP request. It can be useful to analyze, and find out more details about the circumstances of the high load like: What were the bind parameter values of the ViewObject query? Which ViewCriteria were applied (if one was applied)? Did it happen during ApplicationModule activation? Which taskflow was involved ? 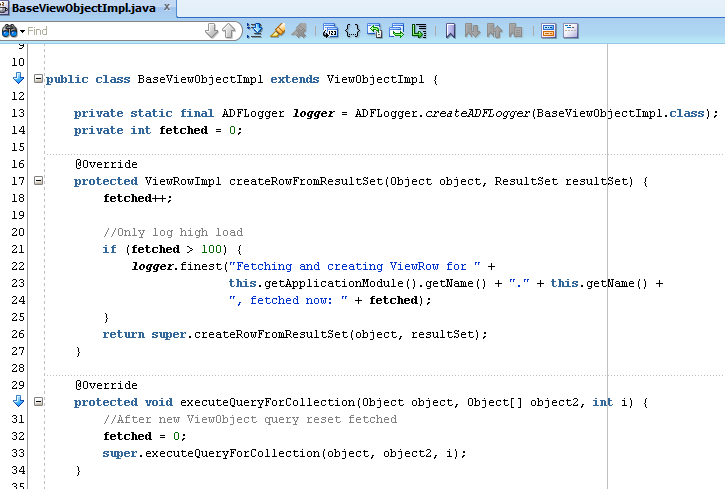 With all this detail information, ViewObject instances that frequently waste ADF BC memory can be addressed. For example by adding extra bind parameters, setting a (better) maximum fetchsize or using Range Paging. And counting them in the BaseViewRowImpl. Before a query is executed (again), you should reset the counter. You can do this in the executeForCollection(), the method that is invoked before each database query. A high load can now be detected in JDevelopers console log. You might want to not log every single row that is fetched but only when you detect a high load. 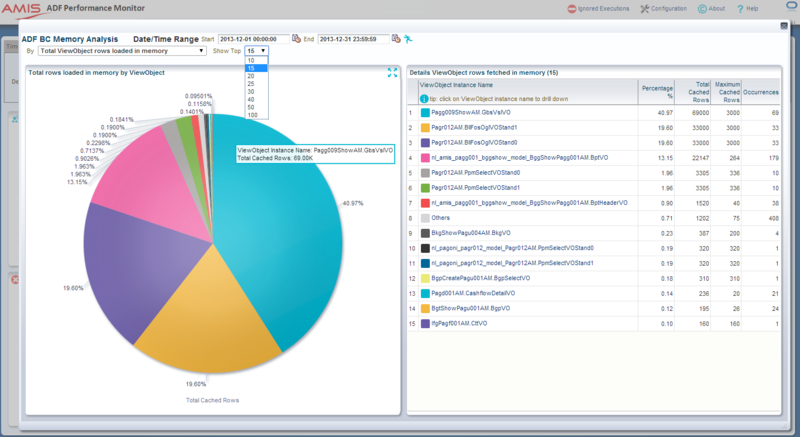 You can get more information on the ADF Performance Monitor website at adfpm.com. A one month trial version is available on demand here. Please tell me where I can download the ADF Performance Monitor tool.